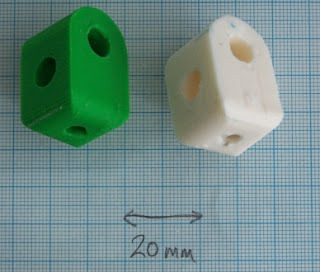 On the left is the original RP part, on the right is the moulded one. What you can't really see here are the complicated internal cavities. I started by super-gluing on a gate (white cone - plastic rod through a pencil sharpener) and a riser (thin white rod) to the original part. 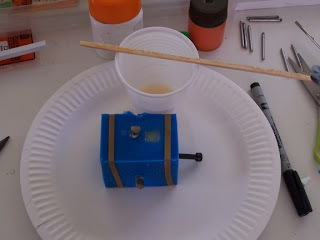 Then I added sticky tape to define a mould split line and put two 8mm rods through the holes. I then put an M5 bolt through an internal trapped nut to hold the rods. I put the lot in a plastic box and poured in Viscolo 22 liquid silicone from Tomps. I should say immediately that this is a fantastic moulding compound. It is very inviscid when pouring, which means that bubbles come out so you don't need to do the moulding in a vacuum. If only it were transparent (so you could see the tape mould split to cut to it after it's set) it'd be perfect. Here are the resulting mould cut to the split and with the rods and M5 bolt put back in. Note the nut floating on the bolt - that's going to get incorporated in the casting and become a trapped nut. 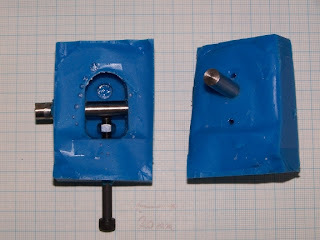 I covered the rods and the bolt (but not the nut) in a thin film of silicone grease. Then I poured the resin, which was Tomps polyurethane fast-cast. I simply cannot rave enough about this resin... It is the consistency of milk when mixed, so it pours really easily, and it sets in half an hour at room temperature. It is just a perfect material. The result was a solid workable bracket, with an embedded nut and all the internal cavities needed. Whats the cost on producing a mold? One issue I have had is getting the finished part to release from the molds, I am also using polyurathane for the casting resin so I assume it is my mold not my resin. Although your resin is most likley a long chain polyol rather than the more durable (expensive) phenol-formaldehydes I have been playing with. Your gel time of 30min would support that idea, since I routinely get gel times in the 5min range. If you want a harder set and a faster set 1% vinyl imidazole in the polyol prior to mixing will speed you up considerable. Thats assuming that you are using an isocyanate as the "part two". A serious advantage of using thermosets of course is that the possible tempature range on the extruder just increased hugely. The mould used about 200g of silicone. The silicone I used is very flexible, and separating the parts was no problem at all. Yes to the temp properties - I'm going to use this for the auger for the granule extruder. I don't really understand this desire to go around the reprap's ability to reproduce itself. Seems to me like a "reprap tree" similar to a phone tree could be set up in advance of the final moment when the reprap can produce all the parts that can't be bought. Then Adrian's reprap makes two of itself, he packs those parts up and sends them off to the two children, then they build and use their reprap to make two sets and send them off to the grandchildren, etc, to the depth of the prearrangement. The initial tree is public, so that everybody knows who they're waiting on. Everybody also commits to being willing to make an additional two sets of parts for grandchildren to bypass a child who can't get their reprap working. I will take this off my to do list. I have worked up a similar scheme to make corner brackets though they use inserts instead of captive nuts to simplify the mold. I will take twenty, tell me where to send the check. To answer Russell, RepRap is still in development. We need a relatively large base of machines running just to get the kinks ironed out. After that your vision is the shared vision. Strictly short-term. When there are 100 RepRaps in the world, and none of them are having their parameters adjusted, it'll be easy to make more. When there are 2.7 and we're setting them up/improving the s/w/making the electronics better, we don't have time on them to make more, and - even if we did - the quality wouldn't be good enough because of those unadjusted parameters. With people clamouring for parts, moulding them for a while gives us a way round the start-up bottle-neck. Another useful point is that some materials are easier to mold than they are to extrude. The heat advantages of using a molded thermoset in the extruder suggest that at least will soon become a very common variation of of the 100% extruded reprap. 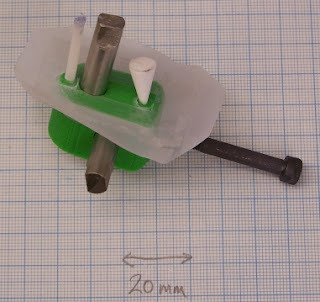 Honestly I have always been of the POV that we should use the repraps for the production of molds, exclusivly. The list of moldable materials is long and well understood with systems already optimized for speed, cost, environmental friendlyness, etc. And the speed and accuracy of molding are going to be hard to beat.